The importance of handwriting. The Doc Smitty spells it out for you. Tears, not just tears, wailing and uncontrollable fear and anger pouring from my almost 5 year old. Were there monsters under the bed? Did he fall of his bike? No, I just asked him to write his name on a paper for his schoolwork. I actually kind of feel the same way as him most of the time. Why would I want to sit down and write something that will take me 5x as long and be 1/5 as legible? Some educators agree with us. Many schools are adopting policies where handwriting is emphasized only very early on with a quick shift over to proficiency in keyboarding. However, just because my 4 year old and I want to throw a temper tantrum any time we're asked to write something doesn't mean that forgoing writing is a good strategy. Dr. Karin James is a scientist with the University of Indiana. She did an experiment where she presents letters to children; some were asked to trace the letters, some asked to write them on a blank page and some were asked to type them. She then shows the children the same letters while they are inside a machine to measure brain activity. Activity levels in brain areas that adults use to read and write were significantly higher in those children who were asked to write a letter vs. tracing or typing. Studies have shown that good writers have higher levels of activation in brain areas associated with cognition and language than poor writers. Another study showed that note takers tended to do better on testing of the concepts presented if they were taking notes by hand rather than by computer. Computer note takers also tended to copy down the teacher's message word for word rather than shorten or rephrasing in their own terms which could to contribute to their poorer understanding. So, what does all this mean? I am constantly tempted to go ahead and have my son learn typing. He is very bright and I know he could type much faster than he could write ... maybe this would lead to less frustration (for him and me). But, this might not be the best thing for him in the long run. 1) Thank you notes for gifts, experiences - Nothing makes grandma and grandpa happier than getting a note from their grandchild about their visit. 2) Story prompts - Give them 1 sentence and let them go. Then help them act out the story they have written. 3) Encourage drawing as well - Fine motor skill development through other avenues can also be helpful. Let's keep our kids writing as long as we can. It is good for their learning and helps protect them from iPhone thumb. 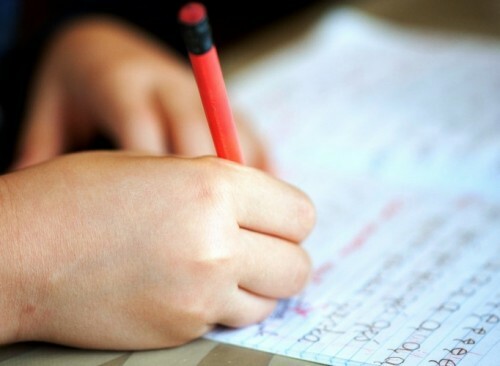 What strategies do you use to keep your kids writing? Do you have any information on a little older child who has dysgraphia? (spelling) He is 11 1/2 years old, he is also a left handed writer and eater, but does most sports right handed. To add confusion, his right foot left foot dominance is somewhat equal. I would appreciate any information you can share. Thank you. Hello Teresa,We will look into gathering information. This sounds like a good idea for a post on our newsroom. Thanks for the idea.